Part 4 centres on smart packaging for user convenience. Each chapter starts with a definition of the technology, and proceeds with an analysis of its workings and components before concluding with snapshots of potential applications of the technology. 1.1 Introduction and Background Information. 1.8 Flavour/Odour Absorbers and Releasers. 2.2 Bread and Bakery Products. 2.6 Outlook and Future Developments. 3.3 Carbon Dioxide Scavengers and Emitters. 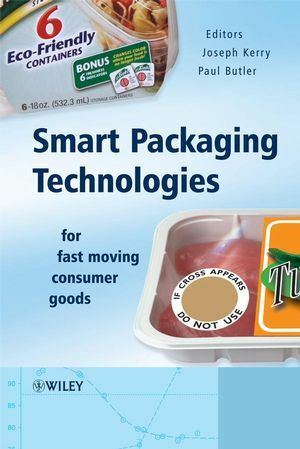 3.9 Potential Future Applications for Smart Packaging with Meat Products. 5.2 What Are the Parameters of Fish Quality? 5.3 Mechanisms of Fish Spoilage. 5.7 Overview: TTI versus FQI. 5.8 Modified Atmosphere Packaging (MAP). 6.1 Background of Antimicrobial Packaging Systems for Food. 6.3 Demand for Antimicrobial and Disinfectant Chemicals in the U.S Market. 6.4 History of Antimicrobial Packaging in Industry. 6.5 Antimicrobial Agents in Use for Commercialization. 6.6 Mechanism of Antimicrobial Packaging Systems. 6.7 Design of Antimicrobial Packaging Systems. 6.9 The Future of Antimicrobial Packaging Systems. 7.2 Freshness Indicators for Quality Indicating Metabolites. 7.6 Other Quality Indicators for Microbial Spoilage and Contamination. 8.2 Principles of Moisture-Management and Water Activity. 8.4 An Active Moisture-Management System. 8.8 Marketplace Executions and Testing. 9.2 Packaging Requirements for Fruits and Vegetables. 9.5 Gas and Volatiles Indicators. 9.6 RFID in the Fresh and Minimally Processed Fruits and Vegetables. 10.3 Discussion of Specific Packaging Materials. 10.4 The Influence of Product and Packaging Materials on RFID. 10.5 The Influence of Packaging System Characteristics on RFID. 11.1 Marks and Spencer Foods. 11.2 Marks and Spencer Clothing. 13.2 Evaluating the Consumer Value Proposition. 13.3 Improving Convenience in Product Use. 13.4 Improving Convenience for On-the-go Food and Drink Consumption. 13.5 Adding New Convenience Functionality – Self-Heating and Self-Cooling Packaging. 13.6 Improving Openability in Packaging. 13.7 Making Packaging Reusable for Other Functions. 14.3 Natural Charge Separation Phenomenon. 14.4 Flow Electrification for Charge Separation. 14.7 Induction Charging for Charge Separation. 15.1 Introduction – Drivers and Packaging Needs. 15.2 Current Smart Packaging Examples. 15.3 Latest Developments and Future Opportunities. 16.4 The Statistics of LSA. 16.5 The Practicalities of Using LSA. 16.6 Applications and Advantages of LSA. 17.3 Legislation Relevant to Smart Packaging. 17.4 Demonstration of Compliance of Active and Intelligent Packaging.